Utilities work has begun on a ‘community’ down the street – a place that previously hosted a mix of Mockernut Hickory, Carya tomentosa, Tulip Poplar, Liriodendron tulipifera, Sweetgum, Liquidambar styraciflua, Flowering Dogwood, Cornus florida, and Yaupon, Ilex vomitoria. As the crow flies (or perhaps, osprey), this site is about 1800 feet from the Intracoastal Waterway, and a whole lot of salt marsh. The soil is sandy and fast-draining, and for the neighborhood kids, the beginnings of site preparation have made for some great ‘terrain’ in a place where our topo could accurately be described as ‘flat.’ It’s hard to watch the trenches being dug, trees being chopped, and riprap being installed – especially when we know what is coming will be more of the same homogeneous ‘Southern Heritage’ homes landscaped with crape myrtles! As sad as this makes us, there are still interesting things to notice (and record…) as they begin the accelerated artificial ‘succession’ to suburbia! this might be a Variegated Fritillary, aka Euptoieta claudia. Larval hosts include Passiflora sp, which we know are close by! 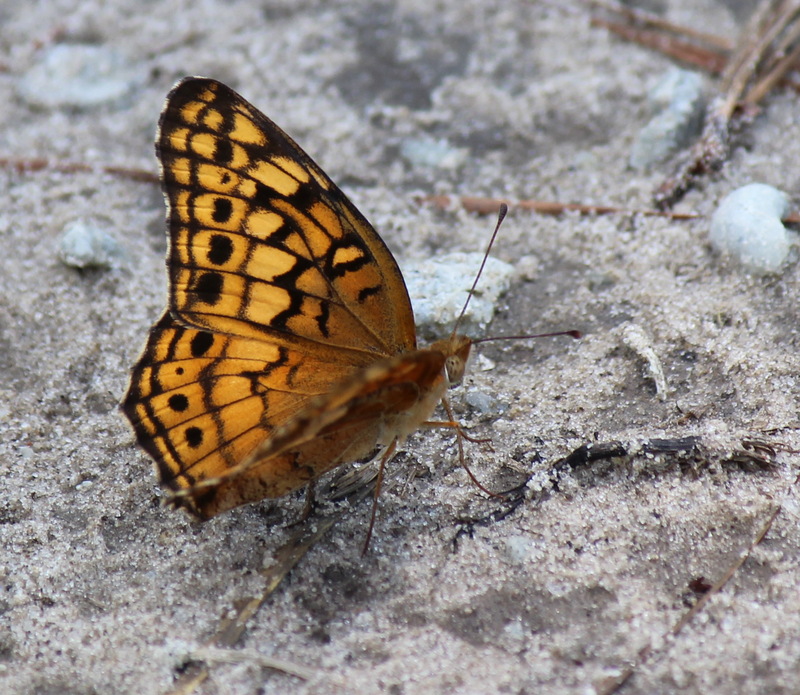 wings closed – same individual – Variegated Fritillary? We have been worried about the seeming low number of butterflies and moths we are seeing this year – it could be the bizarre ice storms we had earlier, and/or it could be exponential increase in land-clearing. But on a sunny day, after a huge rain, the site has come to life with a few species that are taking advantage of the bare soils and temporary puddles. 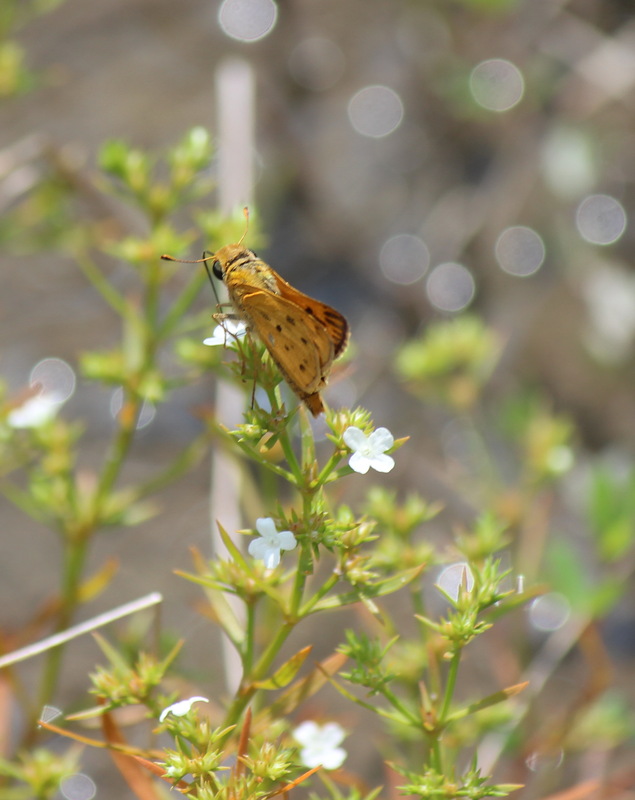 possibly a Fiery Skipper, aka Hylephila phyleus, on the delicate flower of Rustweed, which is considered a lawn pest! 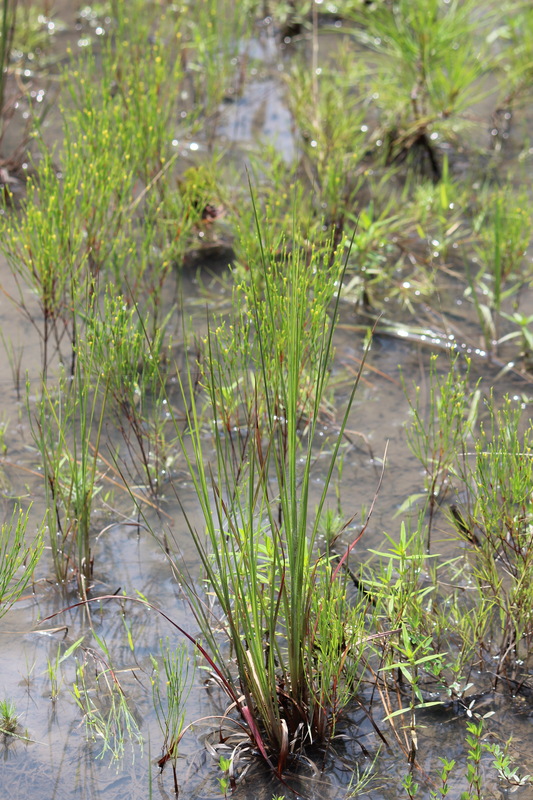 fast-draining puddle, with what I think is Pineweed, aka Hypericum gentianoides, and maybe Barnyard Grass, aka Echinochloa walteri. 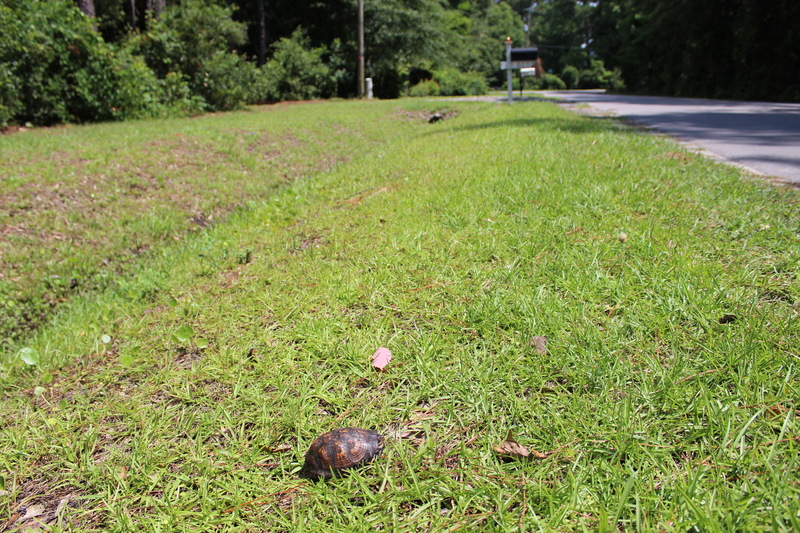 It’s fascinating to see the combination of native colonizing species that are competing with the invasives. Chinese Tallow, Sapium sebiferum, (not shown!) is in great abundance, and nothing (of course) is eating it. 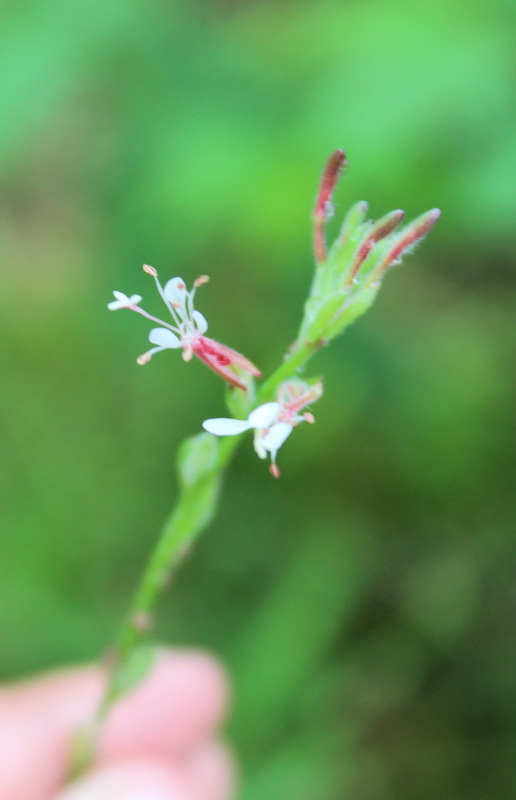 On the flatter ‘homepad’ areas, particularly where drainage is slightly poorer, there is the lovely Rustweed, Polypremum procumbens, and Virginia Buttonweed, Diodia virginiana (two more plants that are considered to be ‘lawn pests.’ Yikes. As usual, better living through chemistry?!) 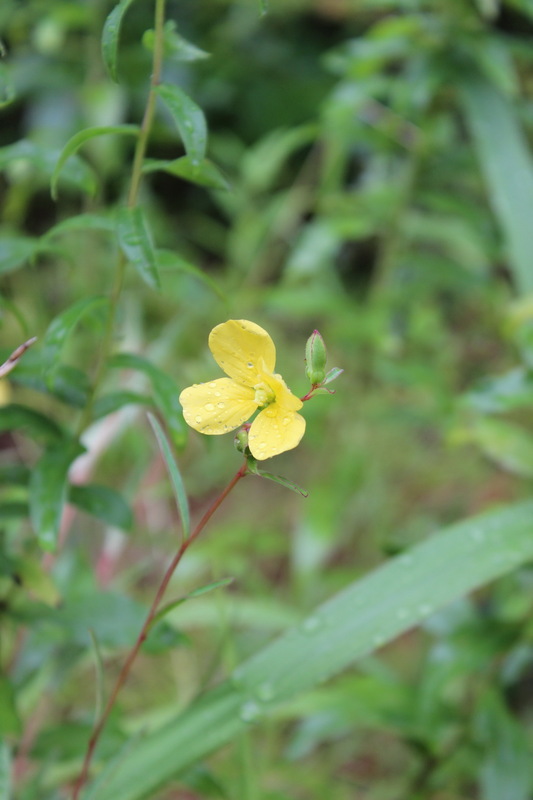 A fascinating find is the clumps of a Hypericum species – not sure which, yet! replacement value – conservation, first please? a real place, not a museum exhibit. 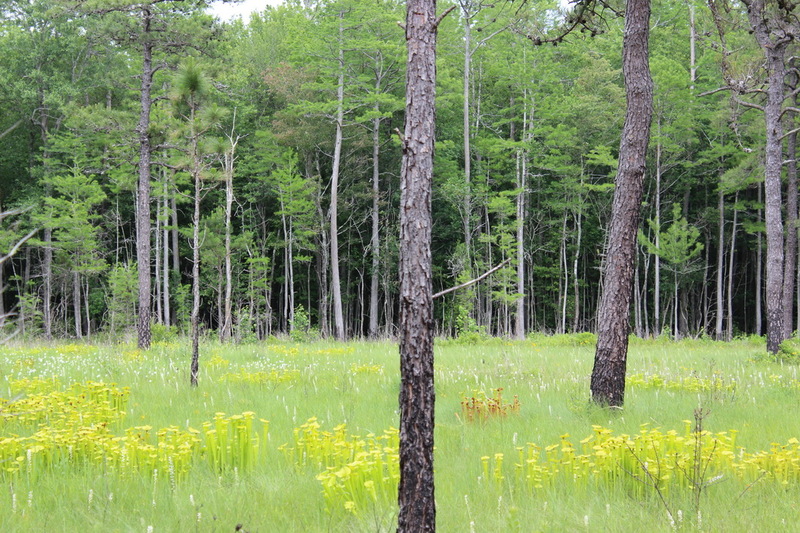 a pine savanna in SE NC. 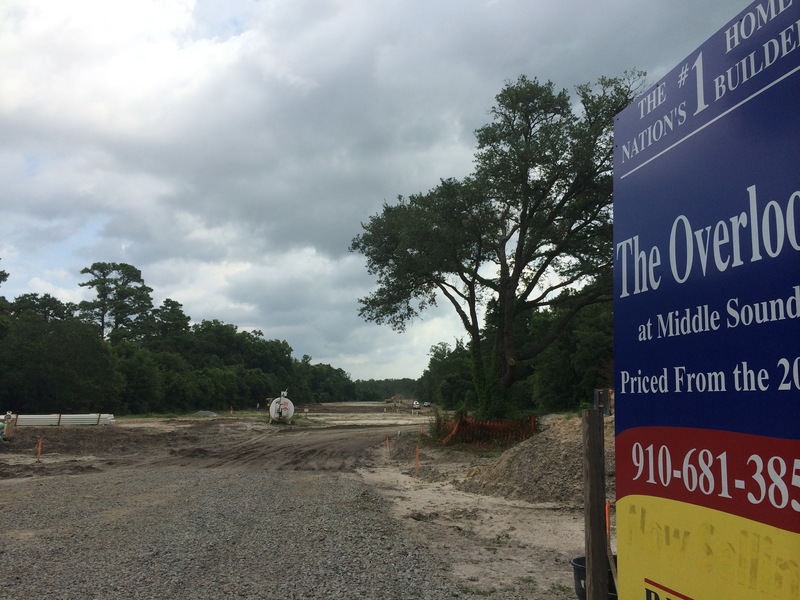 A renewed gold rush for builders is rapidly denuding last bits of undisturbed habitat. Existing built-upon areas are almost exclusively (re)landscaped with a ‘plant palette’ consisting of exotic and often invasive species. Without any ‘real’ nature* as reference, anyone who did not grow up here would assume that Crape Myrtles, evergreen Azayas (phonetic! 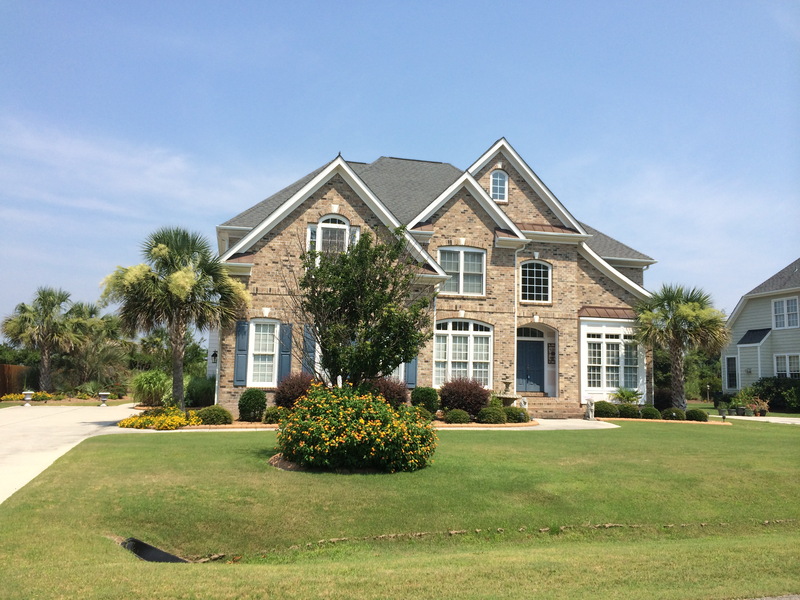 ), Camellias, Eleagnus, Privet, Nandina, Loropetalum, Pampas Grass, and Daylilies are the essence of coastal southern habitat. When ‘vacant’ land is ‘developed,’ it is often scraped clean of all vegetation, in order for potential buyers to be able to visualize possibilities, and also to make things easier for construction. After the buildings are in place, then one can landscape, an additive (rather than conservative) activity that is a tremendous money-maker for horticultural industry. Around here, many of the most characteristic native plant communities exist only in isolation, like museum artifacts, which only serves to reinforce a sense of place that is based in artifice. Even self-described nature lovers fall into the ‘purchase and plant’ mindset, mostly because they have to install what could have been conserved, with just a little bit of forethought. With ‘Git-r-dun’ as our local mantra, forethought is not a priority. * ‘undeveloped’, a relative term! fresh mushroom for breakfast. 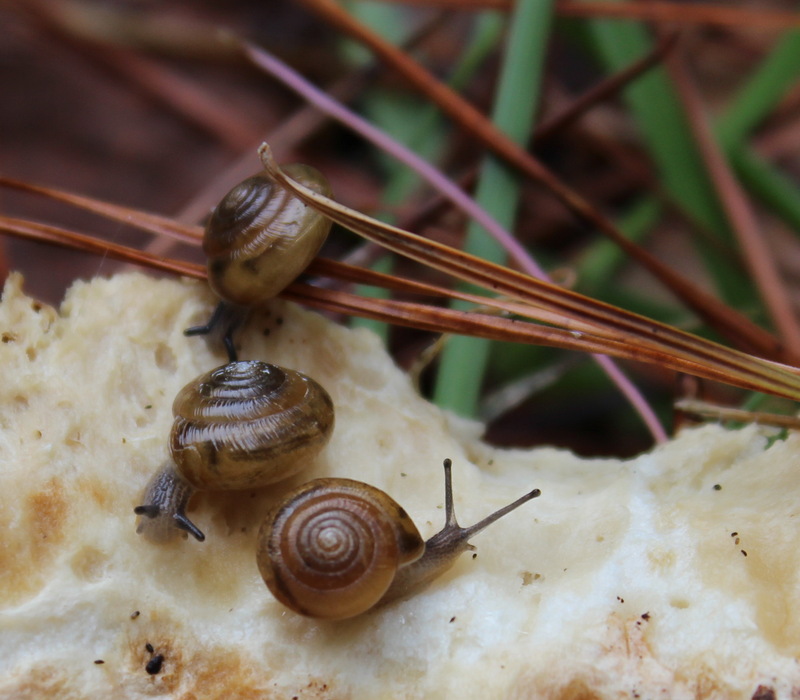 note pine needles for scale – these are TINY snails! 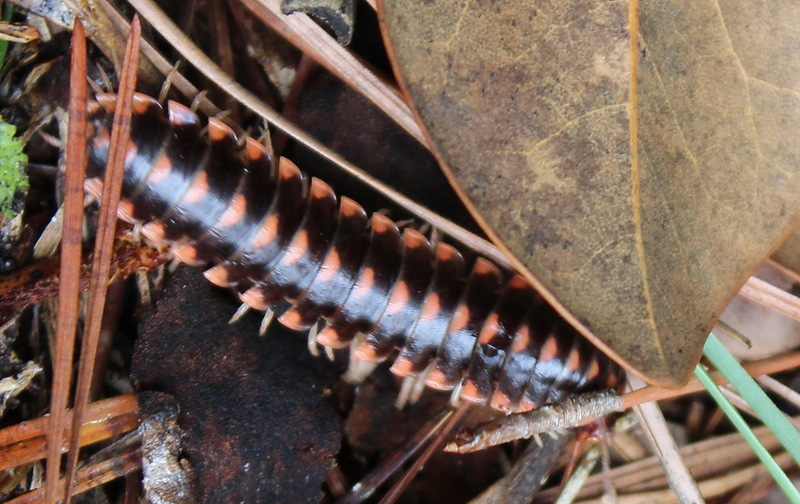 millipede, Apheloria sp., in leaf litter – moving fast…thank you to BugGuide for the identification! Heavy downpours over the last several afternoons have flushed all sorts of interesting wildlife. And although lately we’ve been seeing a lot of Great Blue Skimmers and Blue Dashers, this morning they are nowhere to be seen. Wet leaf litter and a heavy sky shifted our focus downward, where some decomposers are out and about. 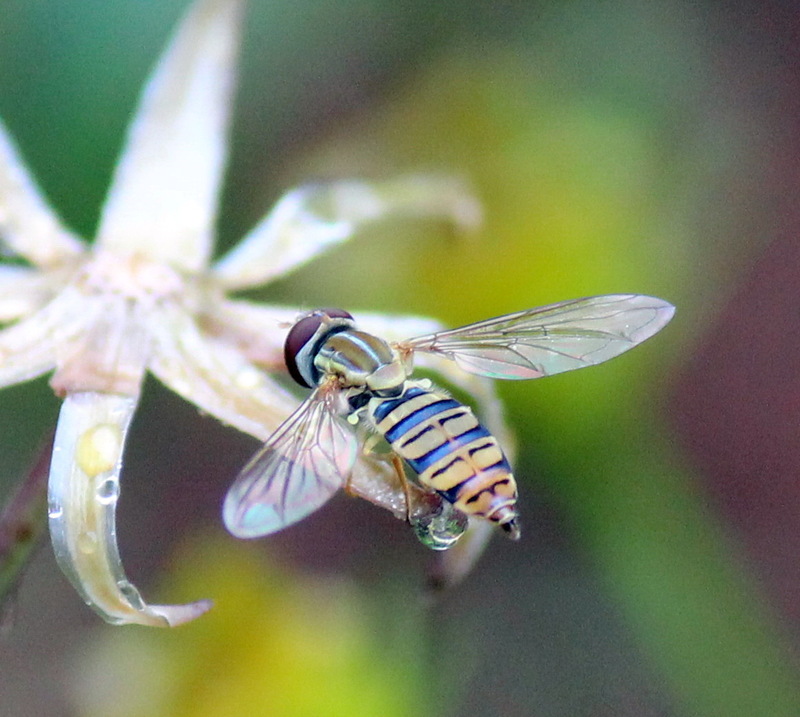 Hoverfly, not hovering – just resting. A few different low-perching insects caught our attention, as well. This Hoverfly, Toxomeris politus, remained very still for its close-up. Hoverflies, also known as Syrphid flies, consume nectar and pollen as adults, and are insectivorous as larvae. Thank you to Bug Guide for providing identification! possibly a Little Blue Dragonlet, Erythrodiplax minuscula – on low new growth of Campsis radicans. This diminuitive dragonfly is a new visitor – we think it may be a male Little Blue Dragonlet, Erythrodiplax minuscula. 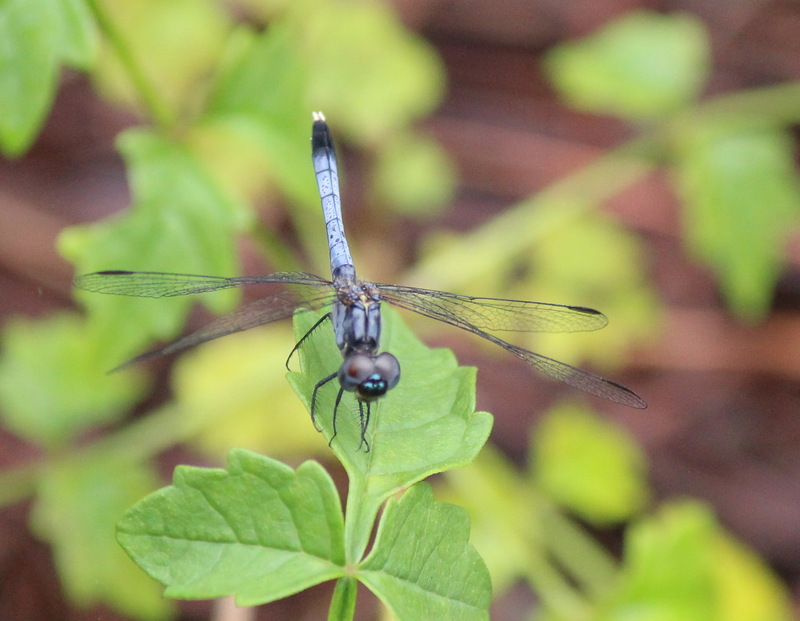 Dennis Paulson’s Dragonflies and Damselflies of the East says that males often perch below knee-height, with their wings down and abdomens elevated – a helpful bit of information in this case! Habitat is typically marshy, so perhaps the wild winds of yesterday’s storm blew this little fellow into our decidedly non-marshy yard? 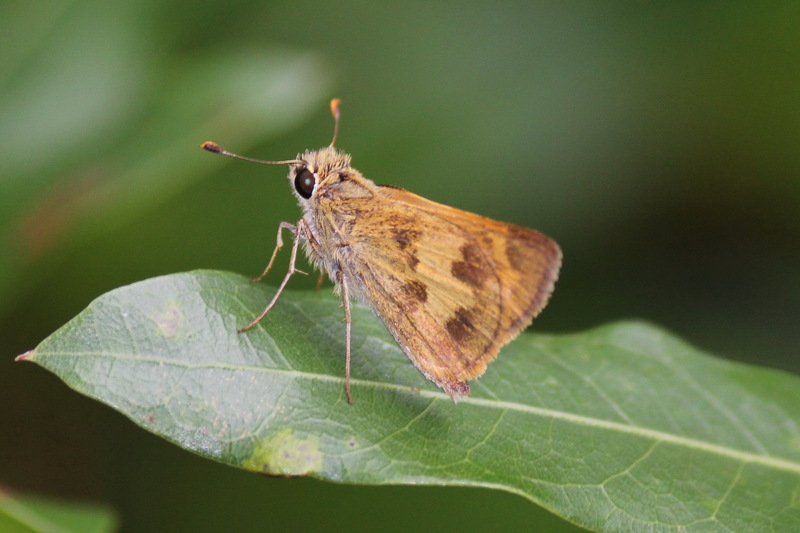 possibly a Whirlabout Skipper, Polites vibex, according to Bug Guide. Just when we thought we’d never see any Lepidoptera, this little one appeared, right after a long rain – perching for a long time on a Laurel Oak, Quercus laurifolia. It looks a bit bedraggled! The young water oaks that are colonizing the slim bit of land between our driveway and our neighbor yield some awesome predator-prey visuals!! what do you have, there? 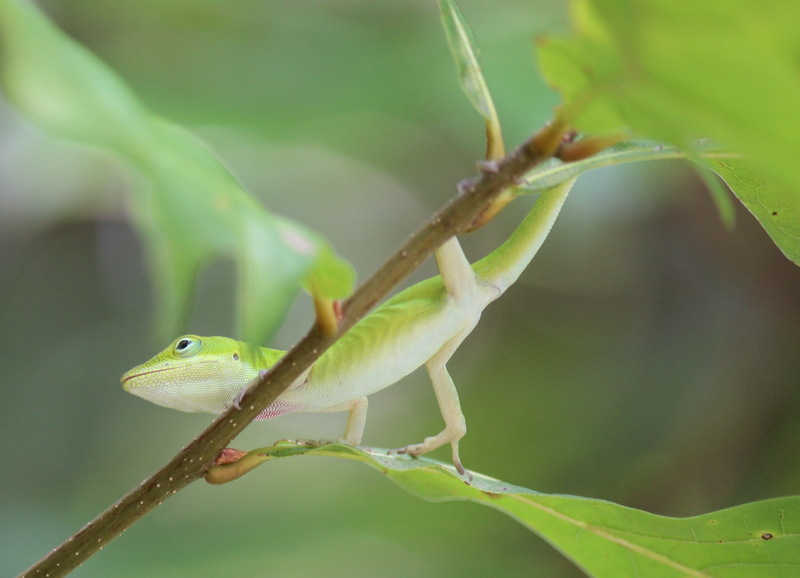 This smallish Green Anole, Anolis caroliniensis, was hunting, and had just captured this Broad-headed Sharpshooter when I managed to get the camera focused. Possibly Citrus Flatid Planthopper, aka Metcalfa pruinosa, on bronze new growth of Quercus nigra. Doug Tallamy’s awesome book, Bringing Nature Home, provides a chart that ranks woody plants by their ability to support Lepidoptera species. (page 146-7, to be specific.) According to this research, the genus Quercus (Oak…) is the “host – ess with the mostest,” (sorry, couldn’t resist) with 534 species supported. who is eating this Virginia Creeper? 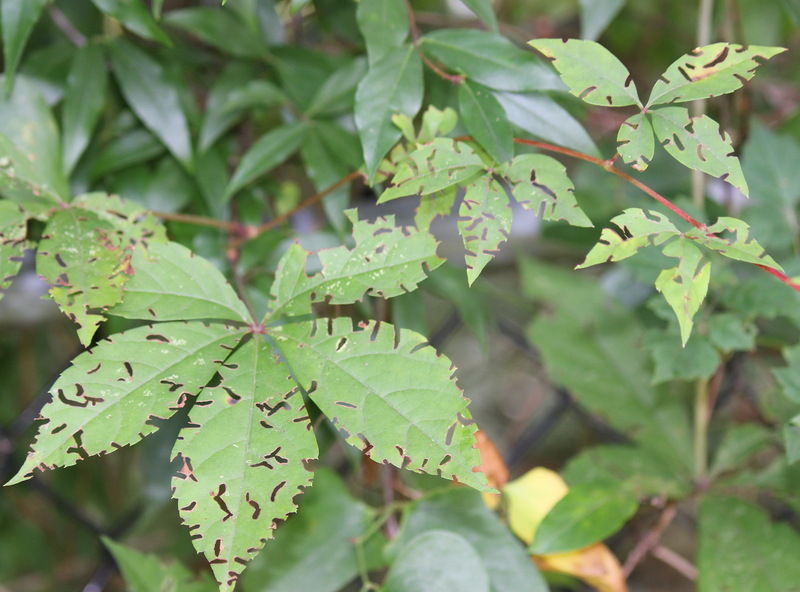 Since watching our neighbor douse their property with Round-Up in an attempt to create some curb appeal (eliminating the IMO very pretty Parthenocissus quinquefolia, Virginia Creeper, among other nice natives), we’ve been wondering if we’d ever see any caterpillars. It might be a rough year so far for the Lepidoptera – it SEEMS like we’ve seen a lot fewer this year. 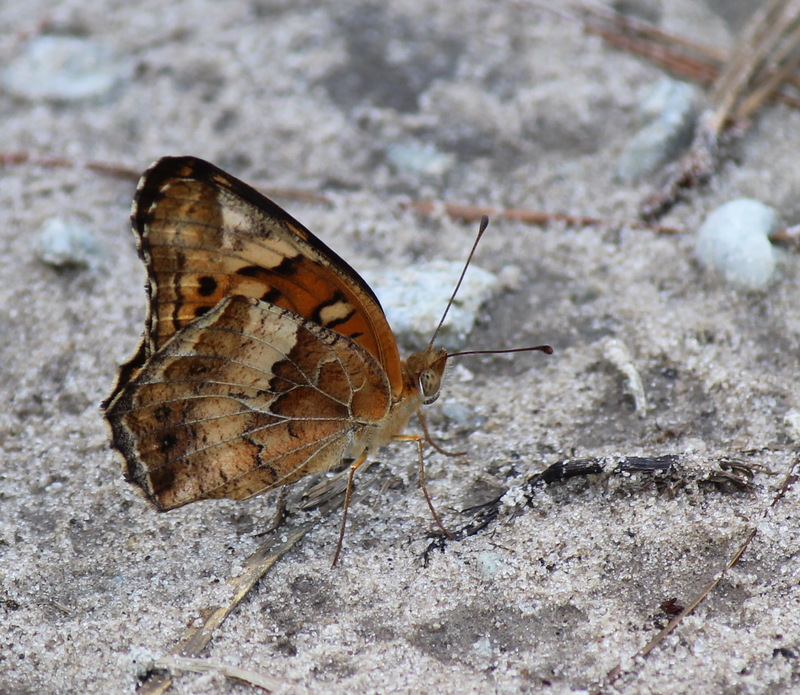 Common Buckeye, aka Junonia coenia – in a nearby vacant lot. One of very few butterflies seen so far in the neighborhood. 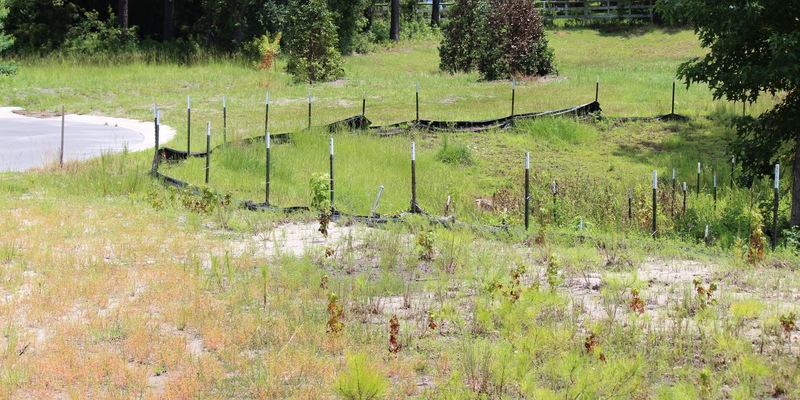 In our efforts to maintain a habitat AND privacy buffer, we happen to have a lot of young Quercus – mostly Q. nigra, aka Water Oak. Rabid Wolf Spider, aka Rabidosa rabida – underneath leaves. These spiders do not use webs to capture prey – they are active hunters, using silk for shelter, and for creating egg sacs. While on the prowl for caterpillars, and looking specifically on Quercus species – here are some other insects and spiders that caught our eye. No caterpillars in this post, because we HAVEN’T FOUND ANY. Red-headed Bush Cricket, aka Phyllopalpus pulchellus – appropriately on a ‘bush’-height Quercus sp. sapling. However, a wide variety of insects and spiders were busy on the Oak seedlings! Northern Mockingbirds are a common sight in our neighborhood, and provide a soundtrack that is a nice summer accompaniment to the cicada/cricket/frog chorus. 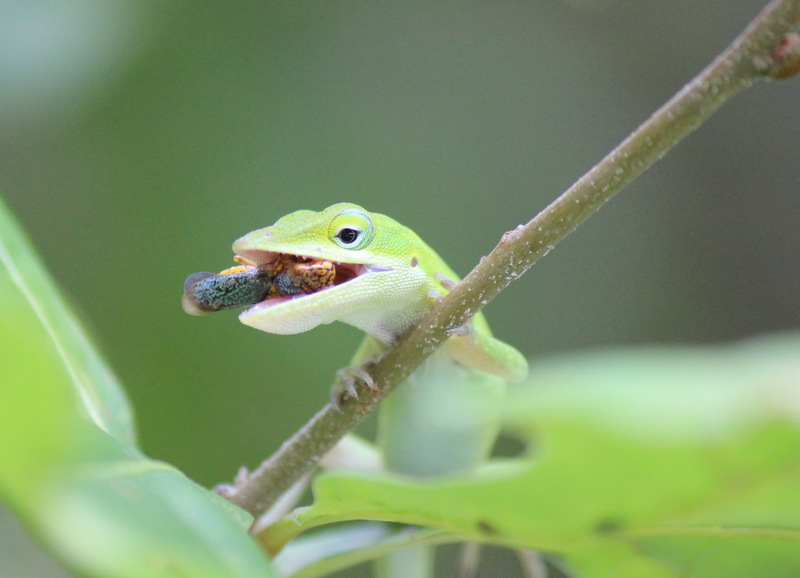 They are so prevalent (for the time being…) that sometimes, we forget how fascinating their behaviors can be. Mockingbirds are non-migratory, so they are fun to watch year-round, and since they seem to have adjusted to human outdoor habitat, they are easy subjects for casual study. During summer months, mockingbirds are predators, hunting insects and other small prey close to the ground, and plucking fruit and seeds from plants during the colder months. And year-round, they are vigorously territorial, as anyone who has been dive-bombed by one of these birds can attest. Grooming on the brush pile. post-prandial wing flash, or just a stretch…? Wing-flashing is a behavior that seems to have a variety of functions. 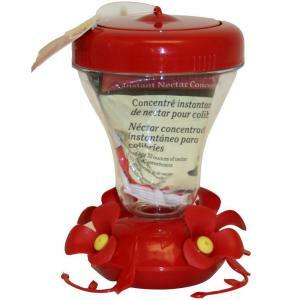 Some sources suggest it is primarily a defensive display, and others add that it also may be used to flush prey. Yesterday, in the pasture, this young mockingbird captured a nice meal, in the midst of what appeared to me to be a relaxing moment of grooming and stretching. The following photos were taken in quick sequence, over about 2 minutes. This is a popular brush pile for hunting – more on that some other time!! 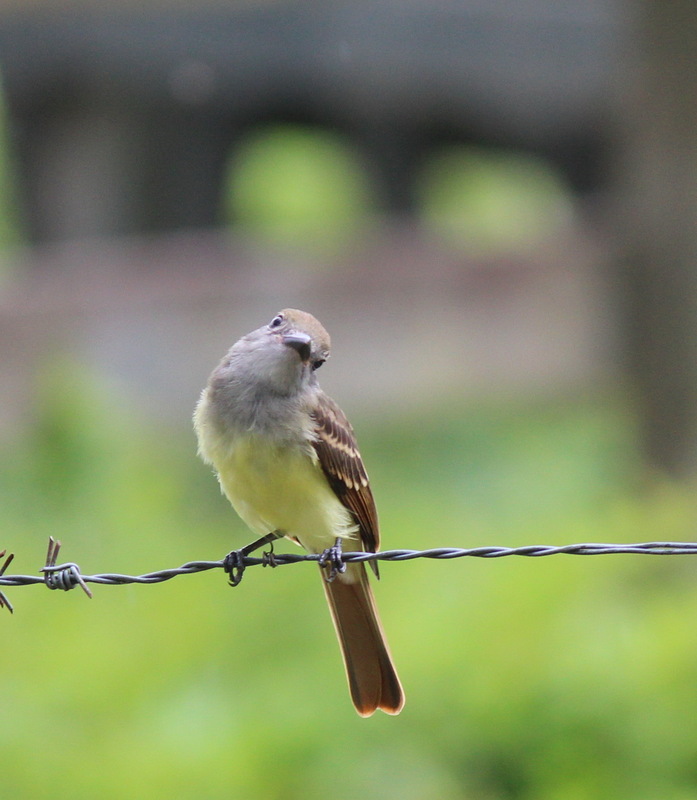 Great Crested Flycatcher – summer visitor to SE NC. 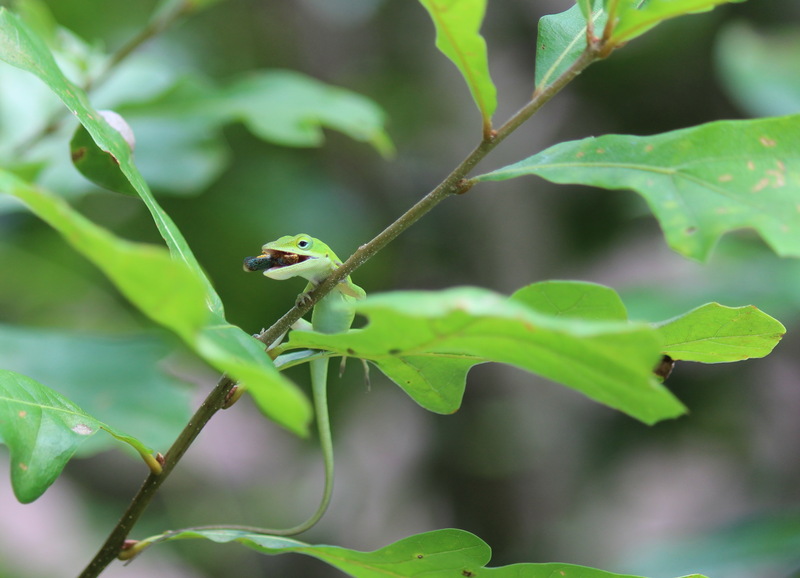 This post was intended to be a short collection of photos taken of Great Crested Flycatchers, Myiarchus crinitus, and Eastern Kingbirds, Tyrannus tyrannus. I was emulating a fencepost, a very successful strategy for bird-watching in suburbia. Eastern Kingbird, hunting in a pasture. Studying these birds, and then hearing Brown-headed Nuthatches up in the pines, led to thoughts about niches and specificity. This barbed wire is a popular perch. Does it resemble a woody vine? afternoon silhouettes – Great Crested Flycatchers taking a rest. On pasture posts. Eastern Phoebe, on pasture fence. This photo was taken in February. Perhaps unintentionally, these descriptions include human-made spaces as habitat. Brown-headed Nuthatch, aka Sitta pusilla, busy in our front yard. The Brown-headed Nuthatches were busy on the pines. Bluebirds were perched on the stumpy upper limbs, swooping down for insects. Nearly every day, we see the Ruby-throated Hummingbirds visit the Trumpet Creeper and Coral Honeysuckle. Guilty. This feeder brought the Painted Buntings to our attention. Habitat, now available at big-box stores. In our compulsion to watch, collect, and control the nature around us, our efforts to mimic evolutionary adaptions are amusing, but also perhaps dangerous. 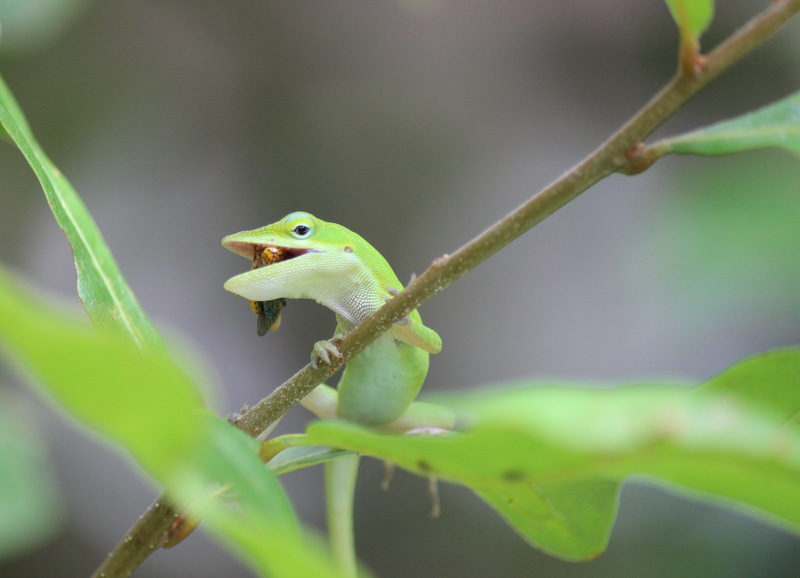 What do we lose when we replace habitat with our own interpretations? Dragonflies are appearing everywhere, even in the most depressing places, like cleared lots. 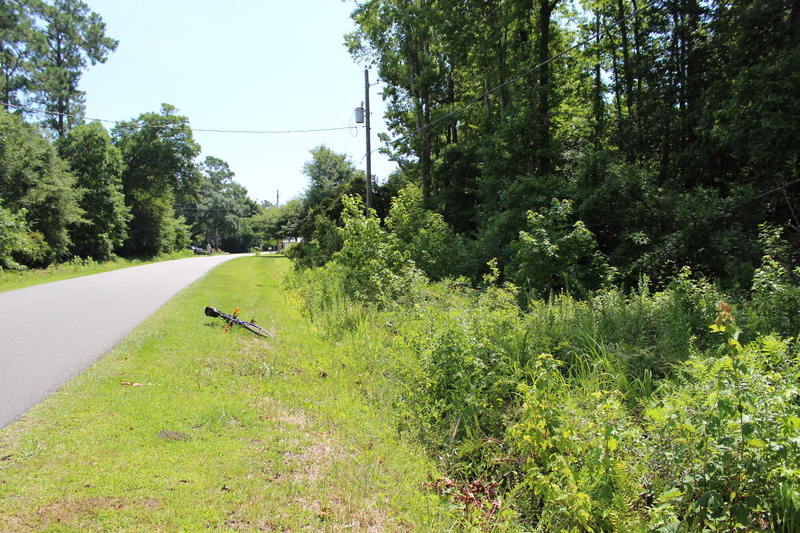 New ‘developments’ are erupting throughout north New Hanover County, filling in any relic open spaces. New Hanover County is the smallest (geographical) county in North Carolina, with a density of over 1000 people per square mile, so planning for ‘growth’ (I guess that means more people?) has been a difficult prospect. One of the reasons we settled in Wilmington is because we were intrigued by the geography (kind of a peninsula! ), as well as the anticipated open-mindedness that comes with a place that has a vibrant university/arts community. Plus it reminded us (very superficially, it turns out – mostly just the humidity and a couple of live oaks…) of the supremely amazing Tallahassee. While there is definitely a vocal minority of people here who care about quality of life and who see themselves as part of nature, rather than apart from nature, the large majority seem to be people who don’t make the connection between their homogeneous manicured yards with 3-car garages, and the sad fact that they can’t swim in or collect seafood from their own creeks. Commendable efforts are (now/finally!) being made by NHC to take a more proactive approach to development, but it may be too little, too late. Huge national home-building companies and a few powerful (and oblivious/profiteering) land barons are on a tear, making more communities named after the natural feature they displace. Dragonfly nymph – found in a pond in one of our better local parks. 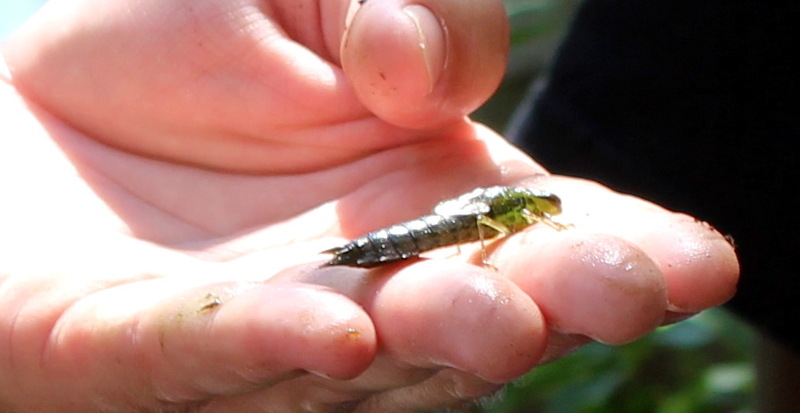 Odonata larvae are considered to be ‘moderately tolerant’ of pollution, and are often included in surveys of water quality. (Here’s a wonderful description of aquatic macroinvertebrates as biological indicators. ) Dragonflies and damselflies spend the majority of their lives as aquatic carnivores – adults lay eggs in the water, where they hatch, and go through several instars (larval phases), before emerging as somewhat short-lived terrestrial winged adults. I think?? this is a female Great Blue Skimmer. 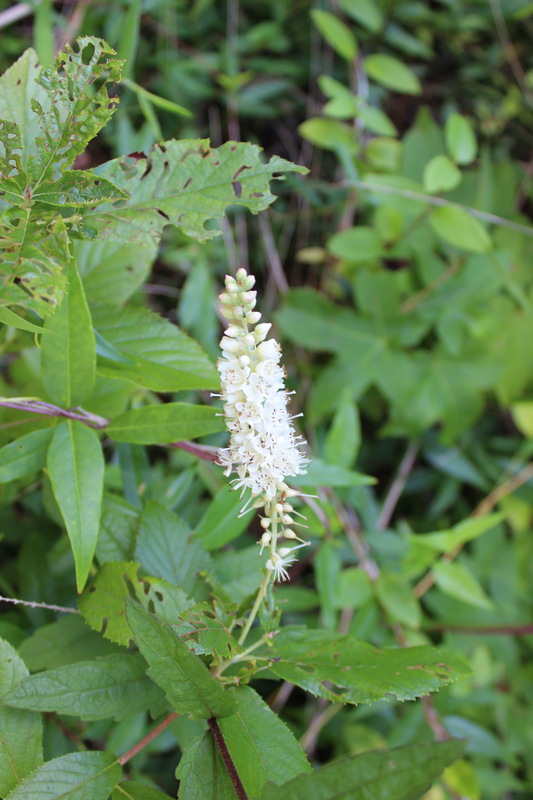 Clethra alnifolia, aka Summerweet – blooming at the top of the ditch. 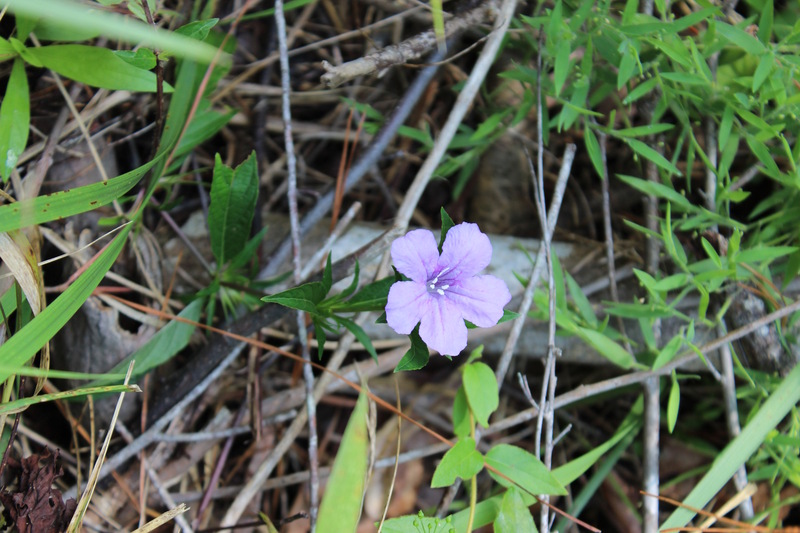 Ruellia caroliniensis, aka Carolina Petunia – this one was kind of a shocker to spot at the bottom of the ditch! Sunshine made ditch exploration a little easier this weekend, plus there were some passers-by who stopped what they were doing to have a look for themselves! 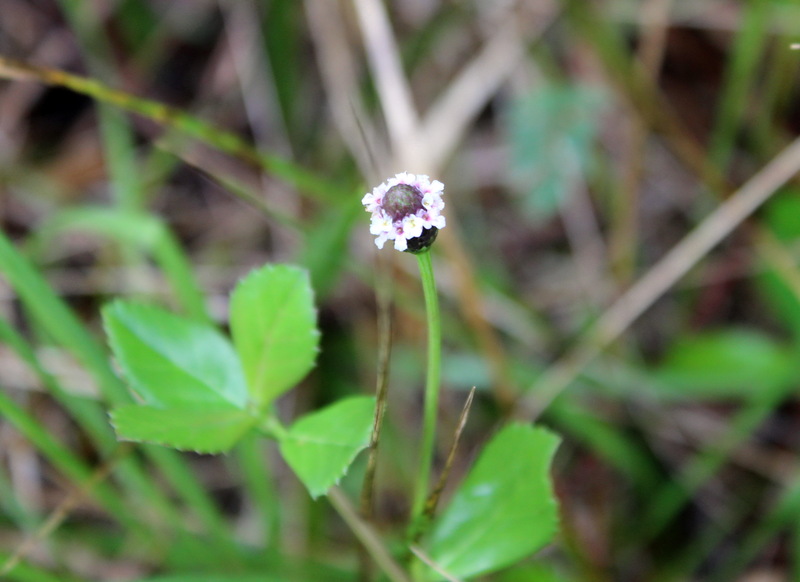 Hexastylis arifolia, aka Little Brown Jug, tucked in with an unknown grass – maybe a Dicanthelium sp.? 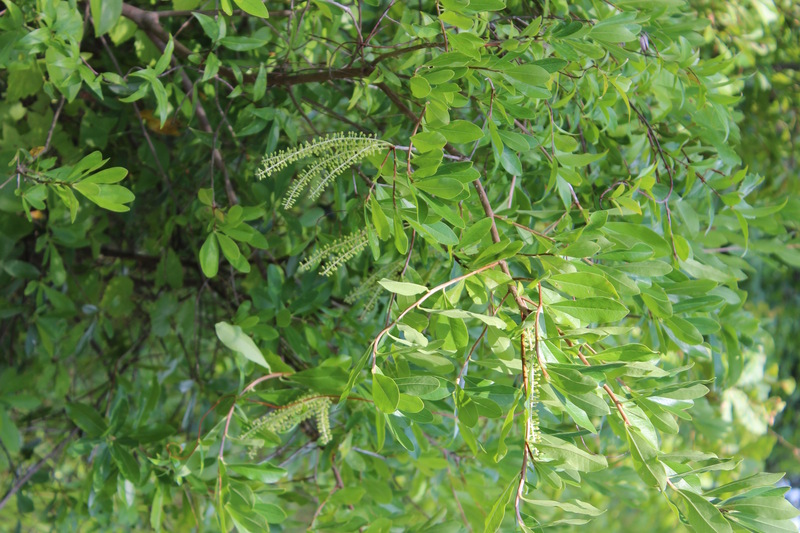 Cyrilla racemiflora, aka Titi, starting to bloom. Time for your close-up, sorry to scare you! 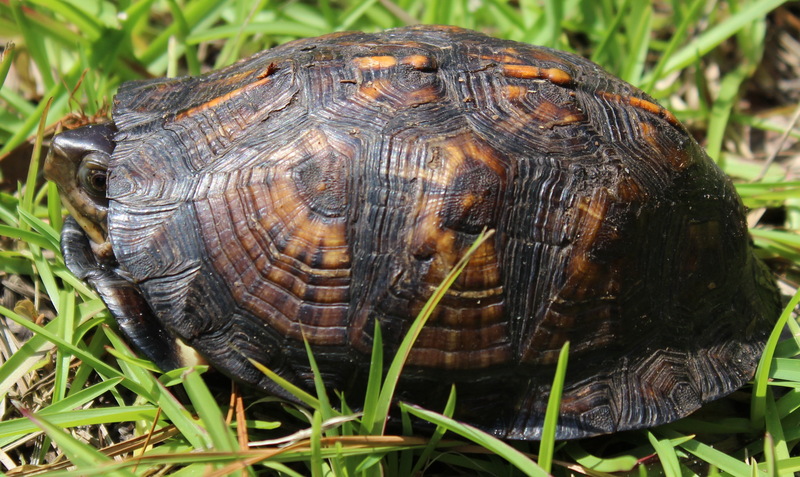 If you are reading this, you’re probably a person who will stop traffic to shepherd a turtle across the road. 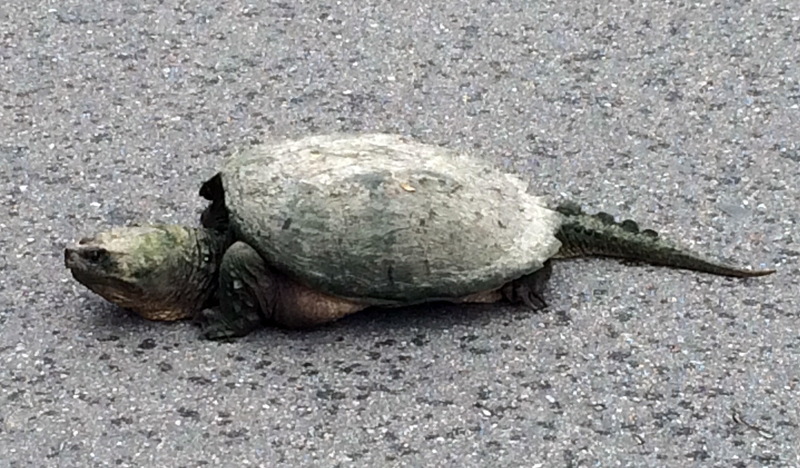 Chelydra serpentina, aka Common Snapping Turtle. 4 cars were stopped to allow her(?) to pass. Um, how to answer those questions honestly?! Around here, the best (and to answer the question of loss…the only) places to look for cool relic bits of plant communities are the edges of ditches. Here are today’s photos, before and during the deluge. Although these ditches are technically ‘disturbed’ areas, if they have been around for awhile, they have probably been left alone after initial excavation, with the exception of occasional mowing. 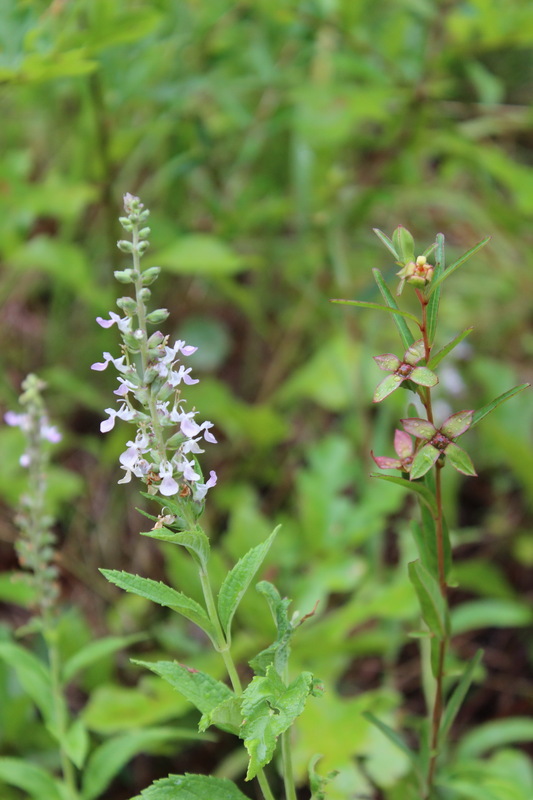 Teucrium canadense, and Ludwigia virgata, petals off! 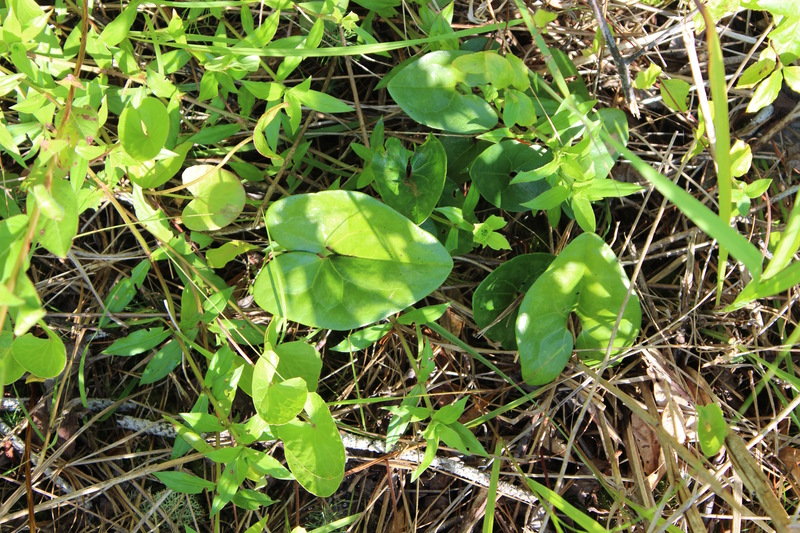 Weakley’s Flora (2012) notes that these plants are generally found in wet pine flatwoods, wet savannas, and rich bottomlands. This area does not look like it has been burned, at least since it has become suburban! Other species I noticed in this area are Sensitive Fern, Onoclea sensibilis, Cattails, Typha sp., Tulip Poplar, Liriodendron tulipifera, Loblolly Pine, Pinus taeda, Sweetgum, Liquidambar styraciflua, etc.. 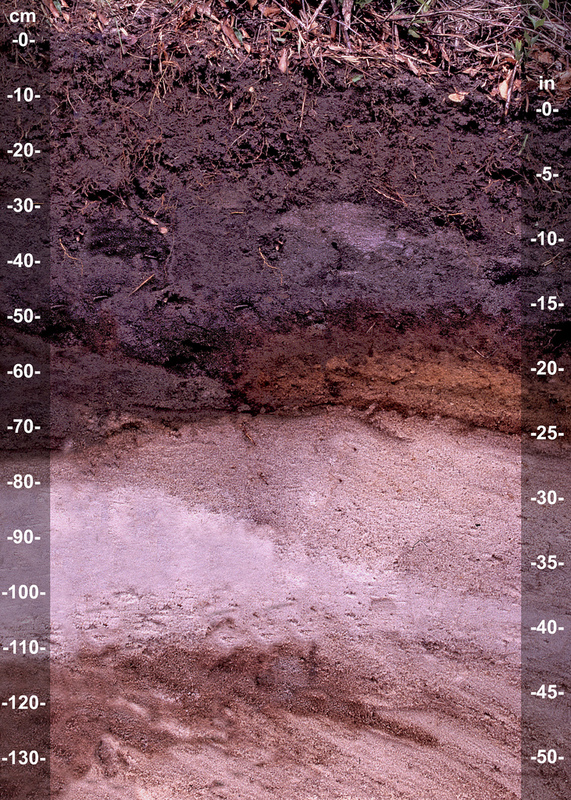 According to Websoils data, the soils are Leon sand, and Murville fine sand – both are described as acidic and poorly drained. (more information) I didn’t do any digging, but would imagine a sample might look something like this?